1. Preheat the oven to 220°C, gas mark 7. Put the tomatoes, peppers, oregano and 4 garlic cloves onto a baking tray. Drizzle with the vinegar and 1 tbsp oil, season and roast for 15 minutes. Cook the farro according to pack instructions, drain and set aside. 2. In a large bowl, mix the veal, breadcrumbs, egg and lemon zest; season. Shape into 8 equally sized balls. Heat the remaining ½ tbsp oil in a non-stick frying pan and add the final garlic clove. Once it turns golden and smells fragrant, remove it and add the meatballs. Cook for 5-7 minutes, until golden on all sides (don’t worry if they’re not fully cooked through), then set aside. 3. 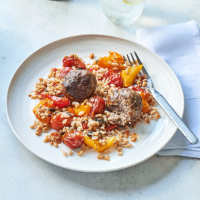 Take the tomatoes and peppers out of the oven; stir in the farro along with 2 tbsp water. Top with the meatballs and return to the oven for 15 minutes or until the meatballs are cooked through and no pink meat remains. Divide between plates and serve.